Ninety-seven percent of scientists agree: climate change is real, man-made and dangerous. This claim is often repeated by environmentalists and the Left, and is most definitely false. Alex Epstein, writing for Forbes, destroyed this claim in his article, “‘97% Of Climate Scientists Agree’ Is 100% Wrong”. One of the main papers behind the 97 percent claim is authored by John Cook, who runs the popular website SkepticalScience.com, a virtual encyclopedia of arguments trying to defend predictions of catastrophic climate change from all challenges. This is a fairly clear statement—97 percent of the papers surveyed endorsed the view that man-made greenhouse gases were the main cause—main in common usage meaning more than 50 percent. But even a quick scan of the paper reveals that this is not the case. Cook is able to demonstrate only that a relative handful endorse “the view that the Earth is warming up and human emissions of greenhouse gases are the main cause.” Cook calls this “explicit endorsement with quantification” (quantification meaning 50 percent or more). The problem is, only a small percentage of the papers fall into this category; Cook does not say what percentage, but when the study was publicly challenged by economist David Friedman, one observer calculated that only 1.6 percent explicitly stated that man-made greenhouse gases caused at least 50 percent of global warming. Where did most of the 97 percent come from, then? Cook had created a category called “explicit endorsement without quantification”—that is, papers in which the author, by Cook’s admission, did not say whether 1 percent or 50 percent or 100 percent of the warming was caused by man. He had also created a category called “implicit endorsement,” for papers that imply (but don’t say) that there is some man-made global warming and don’t quantify it. In other words, he created two categories that he labeled as endorsing a view that they most certainly didn’t. As Alex Epstein details, some of the scientists whose papers were mischaracterized by this paper objected to the misrepresentation. There is more to Epstein’s article that is worth reading, so I definitely recommend reading the whole thing when you have time. It sounds like Mr. Mair is reciting some point of religious dogma that is not to be questioned. And as we have seen, his assertion is not at all backed up by the evidence of a sound study. You can read more about these cases in Walter Williams’s article for Capitalism Magazine, Suppressing Free Speech To Promote The Environmental Cult’s Agenda, and in this Climate Depot article. The data we have show a slight warming trend over the past century and a half. But contrary to environmentalists’ assertions, the science of climate change is not “settled” and the debate is not over, with regard to the size of humans’ impact on climate, the future course of climate change, nor with regard to how any further warming will impact human life in the future. Computer models have constantly failed to predict future climate, and the lack of warming over the past 18 years was not foreseen by climate scientists. 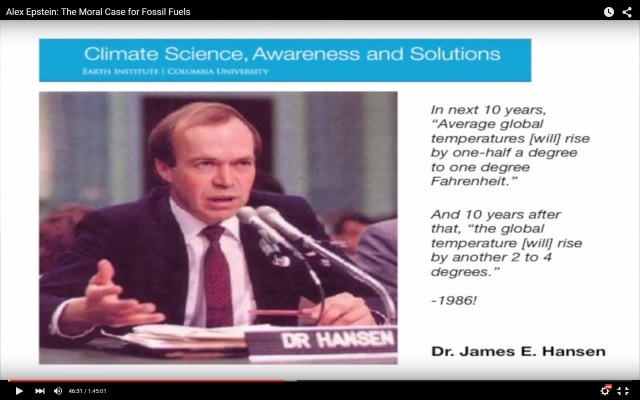 Leading global warming “expert,” James Hansen, makes a very wrong prediction in 1986. Still-frame from the talk by Alex Epstein that is embedded later in this post. 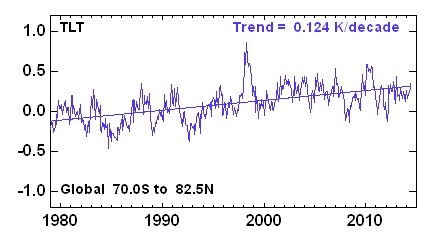 Actual satellite data show that the warming for the 1986 to 2006 period is about 0.25 degrees C: 5 to 10 times lower than Hansen’s 1986 prediction. This entry was posted in Environmentalism and tagged Ayn Rand, barack obama, climate, climate change, college, environment, global warming, liberty, science, Ted Cruz by Sword of Apollo. Bookmark the permalink. Scientific truth is not defined by majority vote. Even if 97 % agree about global warming, it doesn’t prove it. Just 500 years ago 99 % of scientists agreed that sun is revolving around earth.